This program was specifically designed to manage massive amounts of CAM Toolpath Files. It creates a repository (Local or on a Network HDD or File-Server) where you tell it to and then it works using simple import functions where you define the type of toolpath after locating it, a simple toolpath deletion function, the ability to export a copy of a selected toolpath to any desired location on your computer or to a memory stick for you to use. This program also has three quick launch menu buttons, one for your toolpath verification software, one for your CAM software and one for your CAD software which can be setup in the options window. Keeps you toolpath files in a neat, easily accessible order. 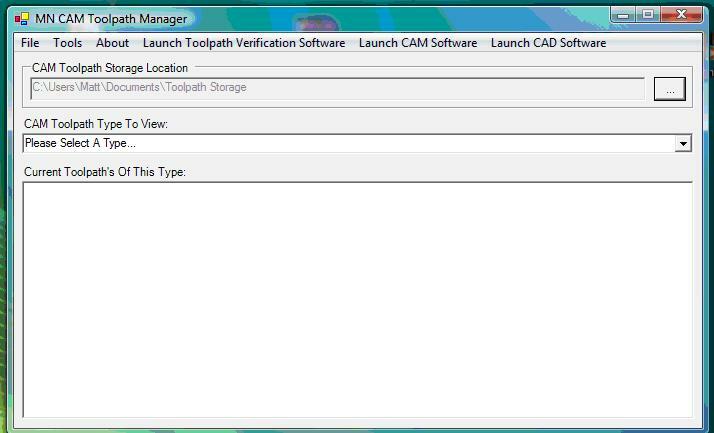 Quick launch buttons to launch your toolpath verification software, CAM software and CAD software. Simple user interface and graphics so that the software runs highly efficiently on your computer. * To purchase any upgraded license for this program, you must have already purchased a previous version of this software and you must email your original order number so we can verify your license for the previous version. Please allow 1 – 2 Business days after you buy this program for us to send you your Registration Code via e-mail.